If you think you need to use it, there is most likely a better approach. query_posts() doesn’t do what most of us probably think it does. Resets the main query loop. Resets the main post global. Creates a new WP_Query object with whatever parameters you set. Confused yet? It’s okay if you are, thousands of others are, too. Rarely, if ever, should anyone need to do this. The most commonly used scenario is a theme that has featured posts that appear visually before the main content area. 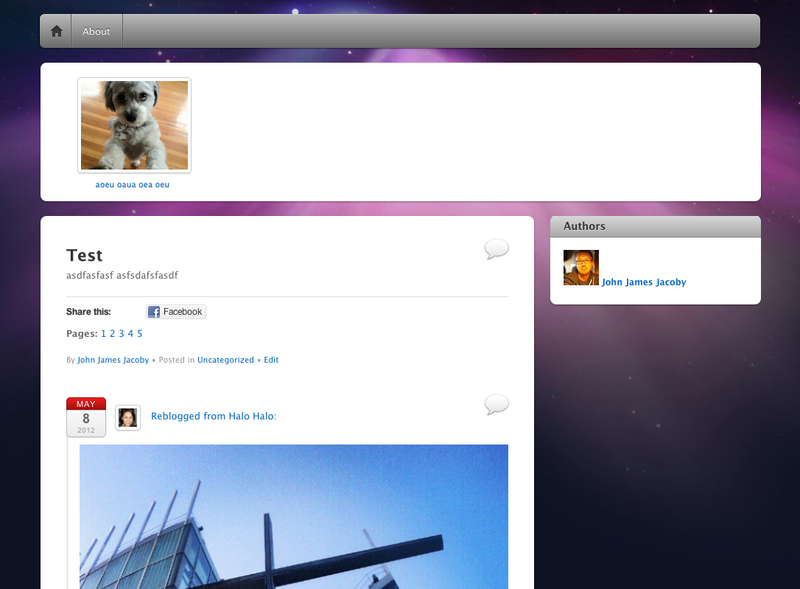 Below is a screen-grab of the iTheme2 theme for reference. Filled the $wp_query and $post globals in PHP. The “Main Loop” consists of 3 globals, 2 of which actually matter. The reason $wp_the_query doesn’t matter is because you’ll *never* directly touch it, nor should you try. It’s designed to be the default main query regardless of how poisoned the $wp_query and $post globals might become. Great! Two queries, no conflicts; all is right in the world. You are remembering to use wp_reset_postdata(), right? 😉 If not, the reason you do it is because every new WP_Query replaces the $post global with whatever iteration of whatever loop you just ran. If you don’t reset it, you might end up with $post data from your featured posts query, in your main loop query. Yuck. Remember query_posts()? Look at it again; it’s replacing $wp_query and not looking back to $wp_the_query to do it. Lame, right? It just takes whatever parameters you passed it and assumes it’s exactly what you want. What if, after your featured-posts query is done and you’ve dumped out all your featured posts, you want to *exclude* any featured posts from your main loop? 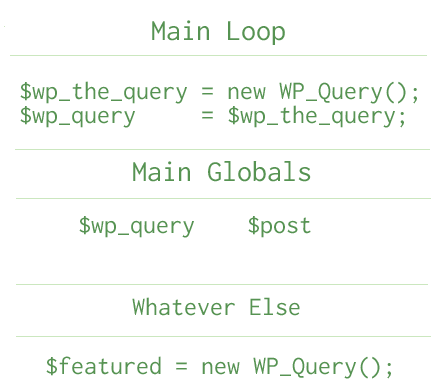 It makes sense that you would want to use query_posts() and replace the main $wp_query loop, right? I mean, how else would you know what to exclude, if you didn’t run the featured posts query BEFORE the main loop query happened? Think of it as the way to convince WordPress that what it wants to do, maybe isn’t really what it wants to do. In our case, rather than querying for posts a THIRD time (main loop, featured posts, query_posts() to exclude) we can modify the main query ahead of time, exclude what we don’t want, and run the featured query as usual. Genius! * before it gets any posts. // Note the we aren't returning anything. // 'pre_get_posts' is a byref action; we're modifying the query directly. * Test to see if any posts meet our conditions for featuring posts. * posts again later without needing to query additional times later. Only proceed if we’re on the home page. Only proceed if our query isn’t somehow messed up. Only proceed if we want to filter the main query. Only proceed if we actually have featured posts. Featured posts? Let’s check for stickies. (At this point, WP_Query runs again, and so does our ‘pre_get_posts’ filter. Thanks to our checks above, our query for featured posts won’t get polluted by our need to exclude things. Take each post ID we get, and store them in an array. Save that array as a transient so we don’t keep doing this on each page load. We’re done with featured posts, and back in our main query filter again. In our main query, exclude the post ID’s we just got. Return the modified main query variables. Let WordPress handle the rest. With a little foresight into what we want to do, we’re able to architect ourselves a nice bit of logic to avoid creating a third, potentially costly WP_Query object. The Depo Masthead theme wants to limit the home page to only 3 posts. We already learned earlier we *don’t* want to run query_posts() since it will create a new WP_Query object we don’t need. So, what do we do? Stop me if you’ve heard this one. We hook onto ‘pre_get_posts’ and return a modified query! Woo woo! Themes are the most common culprit, but they aren’t alone. More often than not, we all forget to clean up after ourselves, reset posts and queries when we’re done, etc… By avoiding query_posts() all together, we can be confident our code is behaving the way we intended, and that it’s playing nicely with the plugins and themes we’re running too. This entry was tagged query_posts, WordPress, WP_Query. Bookmark the permalink. Any objections to using get_posts instead of WP_Query? Not at all; get_posts() actually uses WP_Query directly. Reblogged this on Jeremy Herve. Hi John – This sounds very clever but to be honest I just don’t understand what you’re suggesting so am hoping you can explain a bit further? I totally understand the use of WP_Query and no problem with not using query_posts. I also understand the theory of using the filter before the initial query is called – however I don’t understand how this reduces the amount of queries or why it’s better than using multiple WP_Queries? From what I understood above – you’re still doing 2 WP_queries – so how is this better? It’s better in that you’re only querying for exactly the posts you want, rather than trying to merge posts and loops together, hoping to remove duplicates or intersections. Sorry for my dummy question but… Where do I add this code? …and to change the main query only for the RSS Feed, where do I add this code? Awesome, looks a lot like Andrew Nacin’s WordCamp presentation but is easier to read then the slides. Thanks John! PS. might be worth throwing in a is_admin() check next to ! is_main_query() else it’ll effect your edit.php I think. Thanks for the explanation and clarification on the usage of query_posts. Very helpful and good to be more in the know of best practices with WordPress. You can also chage the query within the “request” filter.. In case you need an advance control! Good point. The ‘request’ filter may actually be more accurate, in that you can skip the is_main_query() check. Though, you’ll likely want to replace it with an is_admin() check, so it’s probably a wash.
You said query_posts() doesnt look back, and with WP_Query you can use wp_reset_postdata() – but isnt that the same thing as using wp_reset_query() after query_posts()? I always thought new WP_Query(); …. wp_reset_postdata() was functionally identical to query_posts();…. wp_reset_query() – with the only real difference being that your creating a new objet with one, and modifying the original object with the latter. I was under the impression wp_the_query somehow handled this properly in either case. Am I incorrect? I was thinking the exact same thing Eddie. Granted my tech knowledge of WordPress is a tad limited, but using query_posts seems to be the more straight forward and direct method (at least to me). Good questions, and I’ll try to address them all. You’re correct that $wp_the_query and wp_reset_query(), do handle the query_posts() usage correctly. wp_reset_query(), is_main_query(), and query_posts(), are all designed to help developers manipulate the main query request. * WordPress does the main request query. * We request the sticky posts. * We query_posts() minus the sticky posts. By planning a little bit ahead, we eliminate 1 query from the process.